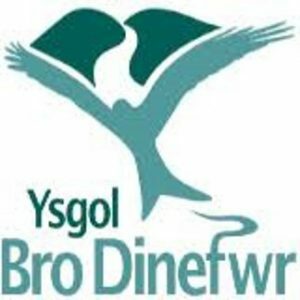 The Ysgol Bro Dinefwr School Staff run group started in October 2018. They were contacted by Run Activator Sharon Leech who went into the school for an information session, giving staff a brief overview of the Run Wales Couch to 5K programme and answering the many questions they had. Most of the participants had never run before and so they were quite anxious at the beginning of how they would be able to manage a 5K distance within 9 weeks. As with all groups, the key is to aim for three run/walk sessions per week. Many manage on two sessions, but it’s almost impossible to advance comfortably by doing just one session a week. 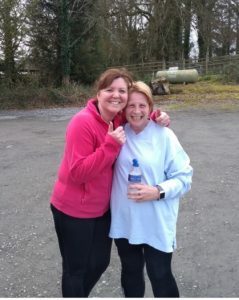 The run leader at Bro Dinefwr is Ann Jenkins. She is a Food Tech teacher and so in the eyes of the other staff, was not as ‘scary’ as being led by a PE teacher! In fact two of the PE teachers actually joined in the session to improve their fitness and enjoy the running themselves! Initially the plan was to meet formally as a group once a week, Wednesday after school. A Facebook group was established and quickly staff were contacting each other to complete the second session of the week on a Friday. This became so popular that Ann actually committed to leading the group twice weekly. Sharon joined the group once or twice in the early stages if Ann was unavailable, but the group was very independent from the beginning. One of the positive factors was choosing to run around the gravel track in the village. Many would think this could become boring, doing laps of a track, but the runners enjoyed the fact that they were always in view of the Run Leader, no one felt ‘last’ or ‘behind’ and they had the security of never being too far away from the finish line! They continued to use the track for many of their sessions, until the winter weather and the dark evenings made it impossible. They then opted to run around the all weather football pitch on the school grounds, until they were up to greater distances and then they did laps of the 1K perimeter of the whole school. each week, with an additional Strength and Conditioning session slotted in. Ann is a big fan of the gym herself and so could lead the group through a good fitness session. 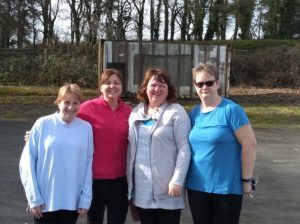 Sharon contacted the group with information about a 5K race at the Botanic Gardens in April – many have now entered this and the group have also done a formal 5K continuous run at the local National Trust Dinefwr Park. Their plan is to do a Parkrun and fit this into their weekly routine whenever they can. With plans afoot for a new Parkrun in Brynamman, staff living further towards Llandovery or the Amman Valley will have a closer option than the current Llyn Llech Owain, Llanelli or Swansea. Ysgol Bro Dinefwr has been a huge success story, largely down to the motivation and commitment of the Run Leader, who has insisted on running through the weather to achieve their goal, something the runners are very grateful for, even if on a cold wet night they may have not felt quite as grateful at the time! Other schools in the area have also started up groups, some with students involved as well. Please get in touch with your local Run Activator if you’d like more information on how to set up a group in your own School.